It's another new application that might be something that might catch your interest. This application was developed by the BirdsCorp. It allows multiple iOS devices to wirelessly share text, links and files between each other and OS X but also between Windows computers and Windows Phone devices. Basically, it is a service that offers easy sharing between devices that normally are incompatible devices. It is not a difficult process, but there are a couple of steps that must be taken. Files must first be uploaded to the AirForShare web server and then files must be downloaded by anyone that is connected to the same WLAN. The application is free application and offers a free service. A great feature is the fact that there are no advertisements showing up anywhere. Now there are some things that you should be aware of if you are planning on or even considering downloading this app. The files that are uploaded have to be no larger than 5MB. What this means is that you can't share any large audio or video files. Something else to remember is that these files will only remain on the server for half an hour. This is not a long-term file storage option. There are plenty of other places to store your files. Something important to remember is that only compatible files can be opened after you have downloaded the files. Some examples of the files that can be opened include .pdf files, .jpg files, text files, .gif files and Mp3 files. Again, this application is free and can be downloaded from the App Store. This is a great application for those users that are interested in sharing their files between various devices. So if this appears or seems to be an application that might interest you, then you should go ahead and download it. This is free so why not go ahead and try it. 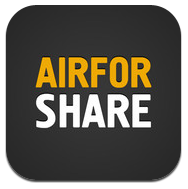 0 Respones to "The AirForShare Application"